Reviews | Arctic Ice Machine Cleaner - Nickel Safe - 1 Pint / 16 oz. Arctic Ice Machine Cleaner is specifically designed for removal of mineral buildup which can lead to bacterial contamination in ice machine equipment. This ice machine cleaner is great at protecting nickel plated evaporators. This ice maker cleaner is safe for use with all ice machines, and it protects both nickel and tin plated evaporators. This ice machine cleaner seems to work great. Just add the right amount to the clean cycle on your machine and the cleaner gets to work. Best part is it won't harm the internal components. Ice now comes our clearer than before. This product was recommend to us to clean our ice machine. It gets the job done and we have recommend it to our friends who own restaurants as well. Great alternative to more expensive name brand products. Cleans our under counter I’ve machine perfectly and helps keep ice crystal clear. Easy instructions for proper dilution for your machine. Clean your ice machine often to keep it working well! If your ice machine is having trouble keeping up with demand, try cleaning it with this and a sanitizer as per the instructions. If that doesn't work, try cleaning the condenser (but not with this obviously). This product is cheap and does a good job. The Arctic Ice Machine Cleaner worked well. We used it with Noble Quick San and we were very happy. We will definitely purchase this product again. I ordered this after reading all of the positive reviews. I broke in my new ice machine by cleaning it first with this. Great product, doesn't leave behind any residue when you rinse properly. Will purchase as needed in the future. This cleaner seems to do its job well from its naked-eye visual results. It has a very distinct smell when its circulating in the machine. Very good product. This product cleans real good all your scum, mold etc inside ice machine and this product is also safe made especially for Ice machines. We use a little of this cleaner every month to help keep mold and the slime out of our ice machine. Does a fantastic job, and hopefully will be good for the long run! This ice machine cleaner is perf3ct for the work it was meant to do. Our maintenance worker is very pleased with the product and advised us thge keep it on hand. I use this product at least once a month to clean my ice machine. So far it has kept my machine clean and no mold. We use this in our older ice machine at least every 4 months and it works great. We have very hard water and it works great on calcium and lime buildup and makes the machine produce ice like it is new again. Our ice machine was due for a cleaning and this stuff works wonders. What I love more is the price so I bought a case. Now our ice machine is like new again. Have started using this product over the name brand product and so far no complaints. It cleans pretty much just as well and the machine is working fine. Works well. I clean our ice maker every other week and this stuff works well. It's safe to use on most commercial ice makers since its nickel safe. Pretty cost effective versus having someone come in and clean for you. I don't know why we didn't find this sooner! It smells strong so I run several cycles after using it to flush the machine out, but works well and have no doubt it will extend the life of our machine. This product is one of the most important aspect of the ice machine maintenance. The maintenance man was very happy that it was bought along with the ice machine. We clean our ice machine frequently. It's important to do so to keep your ice clean. This product really helps. It gets the hard water scale off of the machine parts and keeps it running well. This brand cleans better than the previous cleaner used. Machine seems to stay cleaner also. Will definitely be using this product to help clean and maintain our ice machines. Recommended to clean the ice machine. Just buy this and find a video on Youtube and you can clean your own machine in a morning without having to pay for a service call. It worked Great!! This ice machine cleaner effectively cleans my ice machines. Ordering in bulk saves a ton rather than buying individual bottles from a local refrigeration ship. I wouldn't recommend drinking this cleaner. Great product at a fair price. Very easy to use and did a nice job quickly. A case goes a long way. Well worth it. This is an impressive cleaner. It gets even the toughest grime but is nickel safe! It's a great deal and we highly recommend this product. purchased this to clean our Ice O Matic ice machine, it has clear instructions and works well. It is recommended that you clean your ice machine every 6 months. This is a great product that does just as it says. We use this on a regular basis. I will reorder this item. Thanks for a great product! Arctic ice machine cleaner does an awesome job cleaning our ice machine. Got all the junk out before we used the sanitizer. Will purchase again. We have 2 ice machines and use this to clean on a weekly basis. So far they have done the job to help manintain clean ice for our smoothies. This is a great price for the ice machine cleaner. Our machine is fairly new, however we use this cleaner and it does the job. Serves the purpose but make sure you rinse a little more than instructed as this particular brand tends to leave a funky smell in the ice machine and sometimes leaves a very slight...but still there...taste. We have an ice machine that has not been used for some time so we purchased this to help get the machine clean before we began making ice. It worked extremely well to make sure the machine was ready. Used this once a few months after I bought a manitowoc ice machine... it cleaned where it could reach and did it's job. There are other cleaners out there but all seem to do the same thing, as this one is cheaper then most we'll stick with it. I used the cleaner for the ice machine by my coffee station. I followed the directions and it worked like a charm. I would purchase this product again. Great product at an unbeatable price, compared to the name brand cleaner this product works just as well and is nickel safe for all the expensive machines!!! It cleans as it is meant to do the job. It helps to eliminate to tear down all the components to clean, just pouring it in the water tank and turning on wash cycle as instructed on the label and I am done. Great product at great price. We use this on our Manitowac ice machine. Love the fact that it is nickel safe. Must have to maintain a quality ice machine. Did a good job of cleaning my ice maker. Our water is heavy with minerals and even though I filter it, build up still occurs. As always, can't beat the price. This worked great cleaning our ice machine. The directions were easy to follow, and it didn't take long at all. I will buy this product again. 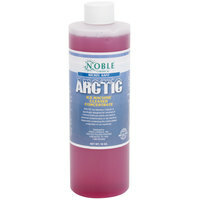 This is a good cleaner for ice machines of all sorts. I use it for my household ice maker at home and for larger ice machines in the restaurant. Great for extending the life of the unit. I've tried tons of products that do not work but this one really does the trick. Though our build up never got too bad, this product took care of our build up quick, allowing us to start our ice machine back up in no time. The Arctic Ice Machine Cleaner is Nickel safe comes in a 16 oz. Bottle. It is great for cleaning ice machines as well as other nickel plated appliences.Removes mineral build up which can lead to bacteria contamination in ice machine equipment.Works great and price is alsome. This is a great product for safely cleaning all sorts of ice machines! We use it on small machines as well as big hotel ice makers! Easy to use and super affordable!! This is a very good product to use to clean your ice machine. It sure beats the prices every where else as well. It's a good deal. We love this product, especially since it's nickel safe! Cleans the ice machine very well! I had been buying this same cleaner for a lot more money. I am glad I found this for a much reasonable price! I had been paying more for the same size of a similar product until I discovered your nickel safe ice machine cleaner! Now I can buy three times as much for the same money!